As the Joshua Tree 2017 Tour winds through North America, the 30th anniversary release of the album is just a couple of weeks away. The re-release of U2’s (first) magnum opus features a 2007 remaster supervised by The Edge, but many fans may not realize that The Joshua Tree was remastered once before, over 20 years ago, and released on a specially imprint called Mobile Fidelity Sound Lab (MFSL). MFSL, a record label specializing in audiophile-quality recordings, was founded by recording engineer and producer Brad Miller in 1977. Miller had begun his career in the late 50s, releasing recordings of steam trains and other environmental sounds on his own imprint, Mobile Fidelity Records. 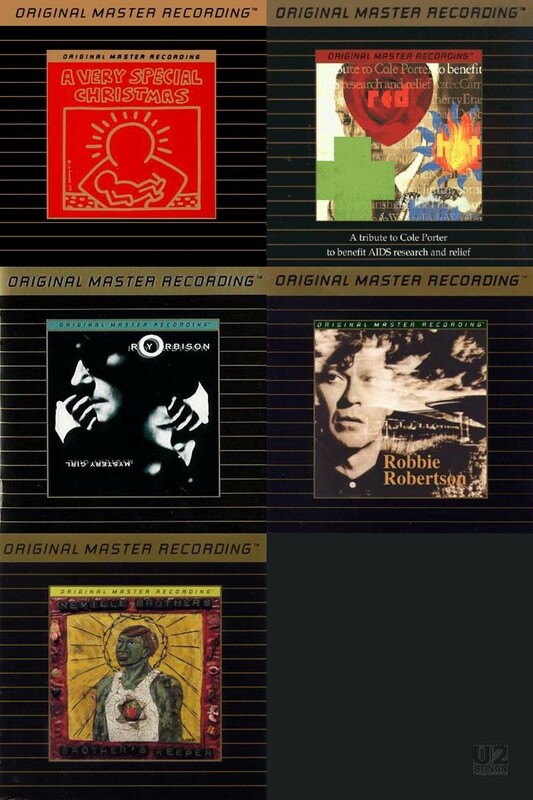 MFSL built a reputation for high fidelity by mastering albums directly from the original master tapes, as well as other specialized processes such as half-speed mastering of LPs. The 1979 MFSL release of Pink Floyd’s Dark Side of the Moon put the label on the map as a major player in the audiophile world. MFSL continued to advance the art of audio technology throughout the 80s and 90s, introducing Original Master Recording cassettes, duplicated in real time as opposed to high-speed dubbing, in 1981. In 1984, MSFL released their first albums on compact disc, and in 1987 introduced the Ultradisc, which used 24-karat gold rather than aluminum as the CD coating. Gold resists the oxidation that could limit the shelf life of standard CDs. In 1992, the Ultradisc II was introduced, featuring a thicker gold coating and a more advanced bonding process. 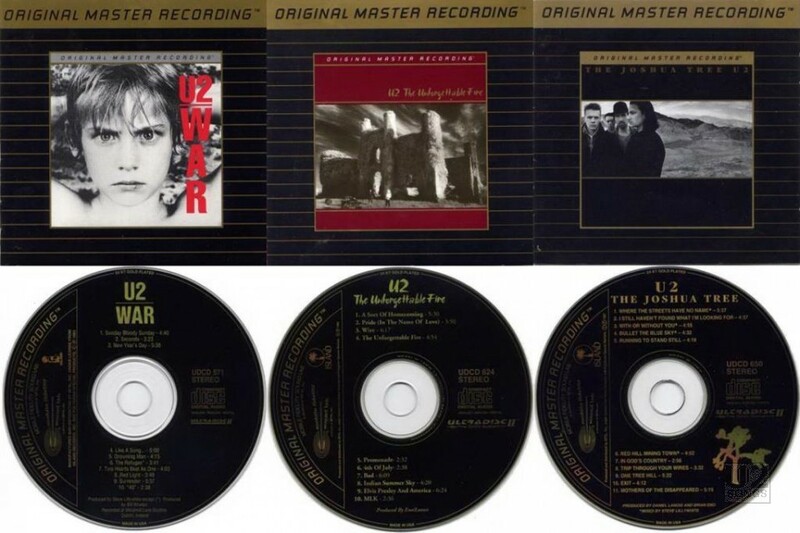 U2’s albums released on MFSL CD all utilized the Ultradisc II technology. 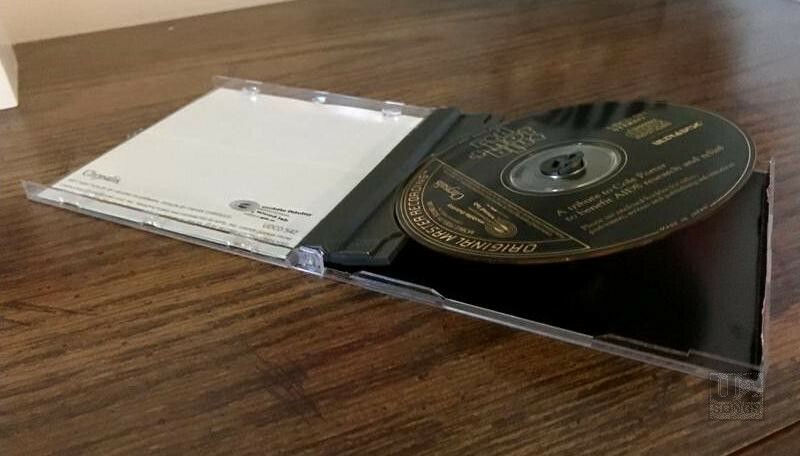 Ultradiscs were also packaged in a unique hinged “lift-lock” jewel case to make removing the CD from the case effortless. Three U2 albums were released on MFSL CD; War in January 1993, The Unforgettable Fire in March 1995, and The Joshua Tree in November 1996. The Unforgettable Fire was also released as a numbered, limited edition MFSL LP in June 1995 as part of the label’s ANADISQ 200 series, half-speed masterings on 200-gram vinyl. The MSFL pressings of all three albums were widely regarded as the highest fidelity available at the time, and there is still debate over whether these versions or the remasters from the mid 2000s are superior. Because MFSL albums are newly mastered from the original master tapes, there are often slight differences from the original releases, and this is true of all of the U2 releases on the imprint. On War, “Seconds” is longer due to an extended “Soldier Girls” excerpt in the middle of the song. “4th of July” on The Unforgettable Fire is some 25 seconds longer and has an extended fade out. There are several other minor differences in track lengths across the three albums. Many early CD versions of The Joshua Tree in the USA were pressed with a track boundary error, with the coda of “One Tree Hill” attached to the beginning of “Exit,” but this error was fixed on the MFSL release. Unfortunately, the MFSL pressing of War has its own track boundary problems. For the majority of songs on the CD, the first snippet of each track is actually attached to the end of the previous track. For example, the first tenth of a second of “Seconds” is tacked on to the end of “Sunday Bloody Sunday.” The error is undetectable when listening to the album straight through, but someone listening to a single track may notice the first sound cut off and an extra sound at the end. As far as we have been able to tell, the error was never corrected with a repressing. There is a discussion in our forums on how to correct this error when ripping the CD. MFSL filed for bankruptcy and ceased production in 1999. In 2001, the label’s technological innovations and intellectual property were purchased by Jim Davis of Music Direct. Under new ownership, the company continues to produce audiophile recordings on vinyl, CD, and Super Audio CD to this day. However, all of the titles featuring U2 content have remained out of print since the 90s, and still command a premium on the collectors’ market.